The heroes of the town of Torch follow a trail of clues to the sprawling junkyard known as Scrapwall, where bands of desperate and violent brigands vie for control of the technological remnants and ruins found within. The Lords of Rust dominate Scrapwall, and their swiftly rising power threatens more than just the town of Torch, for this gang has the support of one of the terrifying Iron Gods of Numeria. What slumbers fitfully beneath the wreckage of Scrapwall could catapult the Lords of Rust into a new level of power if they're not stopped! "Lords of Rust," a Pathfinder Adventure for 4th-level characters, by Nicolas Logue. A look into the secrecy and science of the Technic League, by Jim Groves. Insight into the faith of Brigh, the goddess of clockwork, invention, and time, by Sean K Reynolds. An unlikely discovery in Numeria's wastes in the Pathfinder's Journal, by Amber E. Scott. Four new monsters, by Adam Daigle, Nicolas Logue, and Sean K Reynolds. Each monthly full-color softcover Pathfinder Adventure Path volume contains an in-depth adventure scenario, stats for several new monsters, and support articles meant to give Game Masters additional material to expand their campaign. Pathfinder Adventure Path volumes use the Open Game License and work with both the Pathfinder RPG and the world's oldest fantasy RPG. 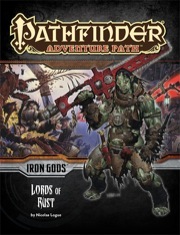 "Lords of Rust" is sanctioned for use in Pathfinder Society Organized Play. The rules for running this Adventure Path and Chronicle sheet are available as a free download (874 KB zip/PDF). Lords of Rust by Nicolas Logue, the second part of Iron Gods is an adventure where the setting is all important. It is a sandbox adventure in pretty much the truest sense of the term (something that is difficult to do in an adventure path). The player characters can pretty much proceed however they want and the setting is almost entirely what drives the action. A poorly detailed setting could break the whole adventure. But this adventure doesn't have a poorly detailed setting. Instead, it has one of the most memorable settings I've seen in a fantasy RPG adventure, and it makes for what will likely be an extremely memorable adventure for any group of players. There is no indication of how Scrapwall functions as a society. 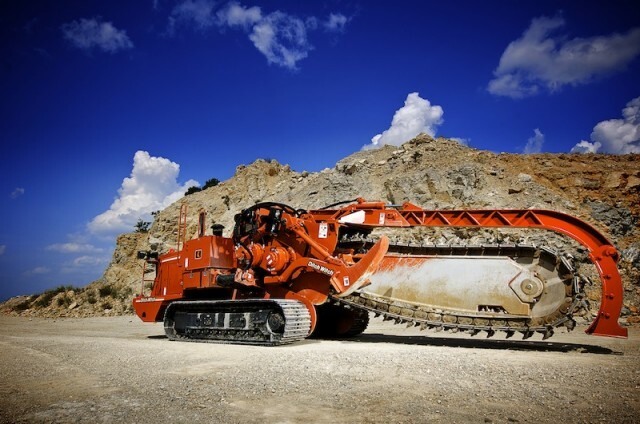 It's piles of rubble and a bunch of people shanking each other. No farms, no merchants, no trade. It's a dungeon but it's full of people who have no way to survive. No me gusta. Flavor and Fun and Chainsaws! An exceedingly flavorful and deadly adventure in the Iron Gods Adventure Path, this adventure takes you to a seedy junkyard filled with criminals, killers, monsters, and worse. You'll make good friends, learn some things bout Numeria's past, and fight a truly unique foe at the climax! The adventure can get dangerous at times! One encounter in particular nearly wiped my PCs twice! This is one of my favorite parts of the adventure path, and I can't wait to run it again! I am a player in this AP and I am loving it. As someone who owns every Adventure Path since The Shackled City, I can honestly say that this is my favorite AP, hands down. The Lords of Rust offers a great setting, colorful characters, and some really interesting turns of events. The sandbox nature of the adventure provides player characters considerable agency over the storyline. I have to be honest and say that while i was reading this i was very dissapointed, from pretty much every aspect, but i was happily surprised when i actually run it and everything turned out well. In contrast to the Fires of Creation (book 1) this module takes the heroes into a Mad Max type settlement in order to present them with threat of the adventure (the Iron Gods) and thusly concluding Act 1. It also has a (very small) section that really evokes Dead Space vibes but unfortunately it's optional and very very small. It has some sandbox elements that i didn't like, but it might be me since i don't like neither to play nor run sandbox campaigns. Almost all of the encounters play very good (difficulty-wise) with a couple quite difficult encounters, keep in mind that (imo) this is true because the PCs are with same gear as they were in the previous book. If you are one of those GMs that want and can build upon what you are presented then you would be very happey with Lords of Rust because it gives you a little information about a lot of things in Scrapwall but it's not fleshed out, so if you want you can do it yourself. I don't give this module 5 stars because it wasn't much fun for me reading it (i was more engaged when i read the article on Technic League than i was in most of the actual adventure) but fortunately both me and my players had fun when i run it. It's something very different than i expected (i expected to continue the themes present in Fires of Creation) and it turned out differently in play than i expected after reading it. Summary: A very good part 2, now let us see where how this adventure path will continue. You'll take your product announcements and like it! Schlup schlup schlup. Eats his produck announzmence like a good wolfie. Holy Crap Liz! What's with you and the number of updates today!? Wow. Cool an article on Brigh, this will be interesting. is it ok to cry?? i have waited so long (pretty much since i started playin PF) to play an AP in Numeria. pretty sure im going human (kellid) titan mauler barbarian for this. I am so looking forward to this one! Brigh is very cool. Will be glad to know more about her than the small tibit in the old 3.5 book. WHO HAS BEEN RESURRECTED BY THE IRON GODS SO NOW YOU HAVE TO FACE CYBER ZOMBIE RUNE LORD KARZOUG AND HIS ARMY OF TECHNO-MAGIC RUNE GIANTS WHILE THE SKY IS BLOTTED OUT BY SQUADRONS OF ROBO-DRAGONS WHO DESCEND UPON VARISIA AND BRING GLORY TO CYBER KARZOUG WHO RIDES UPON A CHARIOT OF STEEL AND FIRE AND LASERS. Sigh...I'm going to be broke for years after this, you realize? Bandits, huh? You sure it's not just Wreck-Gar, and the Junkions causing mischief? Information of Technic League and the Goddess Brigh, I can't wait to read those articles. Congrats to Nicolas Logue to returning to the AP writing team! It's been a while, and I'm glad to see you back.v Can't wait to see more of your insane genius here! HEH! Thanks everyone! It feels good to be back in the saddle! A loud resounding thanks to James Jacobs for letting me contribute to Iron Gods! Saddle? What kind of lo-tech garbage is that? The saddle is mounted with lasers and missiles, and is atop a jet powered flying robot unicorn that has eyebeams and a totally sweet sound system for blasting Ride of the Valkyries while he crushed the huddled masses under his mighty steed's adamantine hooves... I think he's good for tech. I can't wait to read what Nick comes up with. Razor Coast was sweet. Cover image and description updated to final! Orc with a chainsword? Looks like it's time to WHAAAAGH! Ooh-- and a rust monster destroying Amiri's iconic sword on the cover art! Awesome! And now I'm thinking that Amiri will be weilding that orc's chainsword in the art in the rest of the AP... or at least I'm hoping! And I am so psyched to see Mr. Logue back in the saddle again! CHAINSAW OMG YES THANK YOU PAIZO. Part of Iron Gods is the PCs picking up crazy new tech items and using them to kill robots. The art will reflect that in the future. At LEAST once. That is an awesome cover. Half-Elf with Ray Gun? Check. Amiri loses her sword to a rust monster? Check. The only way to top this is with gnome on a jetpack. Lini: "What does this thing do?" Ya best get your Make Whole spells ready. We are in for a bumpy ride. 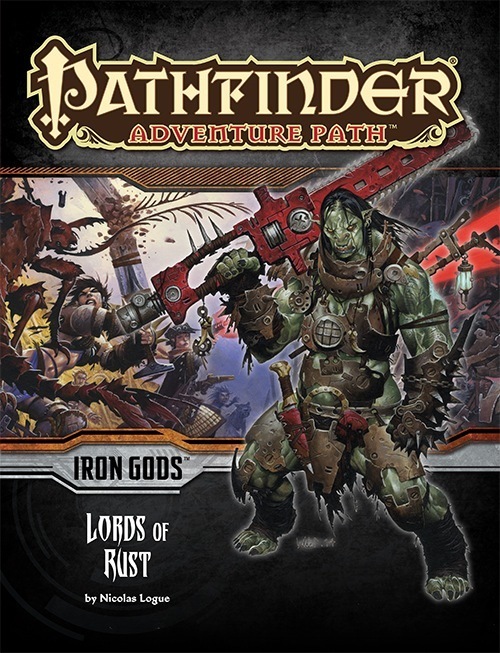 So here's a thought: I know we're probably gonna find out in only a few weeks or so, but the description seems to imply that the Iron Gods were known at least a little bit "before" the Adventure Path (known as in, a knowledge history or religion could provide information). Of course I could be looking way too much into this and whoever knew about the existence of these entities were extremely sparse. Yeah I figured as much. But that's how I can tell I'm super hyped for this adventure path, when I read into literally every word that is said about it like some conspiracy theorist. "Guys, GUYS! When you spell Absalom backwards you get Molasba, which sounds like molasses. That's seven letters, as in 4714. Now back in 2008 in some obscure post a Paizo writer said that molasses is a delicacy in Absalom. Conspiracy concluded: the aboleths are creating a second Azlanti empire via mental control via molasses by 4714 AR. Your move, Paizo." Can we get a chainsaw/ axe/ guitar for the Skald? Pretty please? Nice cover art, can't wait to see rules for chainsaws. ....I really really can't wait for this adventure path. Whoa. That cover. Poor Amiri. She's going to be PISSED. That rust monster will probably be beaten down into nothing but a brown, bloody goo by the time she gets done with it. I mean, that sword is her signature thing, almost the definition to her character. It would be like seeing Droogami bite it on a cover. Though if it's just leading into her getting a chainsword/flamethrower/rocket launcher combo, all maybe in the arm of a robot she tears off and just uses as a massive club until she discovers the other features, that'll be cool. You'll see why in a few months.